Has already put out beautiful roses, even the first year! 3 for $126.00 total Need more quantities? By pairing vines, stunning aerial liaisons can be arranged. We especially like deep purple Clematis 'Etoile Violette' with the blush pink, double-flowered Climbing Rose 'New Dawn.' The Clematis clambers up the Rose's thorny canes and obligingly places its flowers next to those of its host. When the two are at their peak in early July, the display is pure magic, and both can be counted on for repeat bloom through summer. 'New Dawn' is sweetly fragrant and disease-resistant, especially to black spot, the bane of many Roses. We offer one each of the Clematis and Rose. I love my new dawn rose! Excellent reponse time; planting year was challenging; however, pleasantly surprised with results; next year will be better. Will consider additional purchases of same. How simple, a built in trellis for clematis ! I chose this duo to climb a black metal arbor to mark the end of the garden and start of a woodland path. It's first year, last year, the rose bloomed a bit, when I didn't really expect it to, as it was just getting its feet in. This year the rose was heavy with bloom, and bloomed a second time after I deadheaded it. Light but delightful fragrance, and visible from across the yard. So far the clematis has not bloomed, but I'm not worried; sometimes clematis take a bit of time to bloom. I love it and this is the second house I have had it in. At this house I am using it as a screen from my neighbors. Plant the Rose first, then site the Clematis. Select a site in full sun, with evenly moist but well-drained soil. Choosing a site. Roses grow best where they receive at least 6 hours of direct sun per day (more sun means more blooms) and where the soil is well drained. They tolerate a range of soil types (from sand to clay), as long as care is taken to prepare the soil at planting time. Clematis are somewhat less tolerant, and prefer a well-drained soil with a pH close to neutral. Planting the Rose. Before planting a bareroot Rose, remove and discard the packing material and soak the roots for a few hours (not longer). Then dig a planting hole that allows sufficient room for the depth and spread of the roots. Locate the hole so that the base of the Climbing Rose will be about 1′ from the trellis. Discard about one third of the soil dug from the hole and replace it with at least as much organic matter—such as compost, aged manure, or leafmold—and mix it into the remaining soil. Next, set the plant in the hole so that the bud union (the bulge where the top was grafted onto the rootstock) or the point where the first branch leaves the main stem (on Roses that were not grafted) is 3″ below the surrounding soil in the North, and at the same level or an inch above the soil in mild-winter climates. Then push the mix of soil and organic matter back into the hole, tamping firmly as you go. Water thoroughly. Mound the soil around the canes to a height of 12–15″. This prevents the canes from drying out in the sun and wind. Check the canes every couple of days for new growth, and remove the mounded soil gradually once growth appears. Planting the Clematis If you want the Clematis to clamber up through the Rose, plant them about a foot apart. Plant the crown of bareroot Clematis more deeply than you would other woody plants: fully 3–4″ below soil level. This will feel wrong, but will produce a stockier plant. Moisture needs. Newly planted Roses need the equivalent of 1″ of water per week throughout their first growing season. If water doesn't fall from the sky, you must supply it. A generous layer of organic mulch (compost or composted manure is best) helps keep the soil evenly moist. However, be aware that Clematis do NOT benefit from a heavy summer mulching. Clematis grow best when their roots are kept cool; plant annuals or shallow-rooted perennials such as Campanulas at the foot of the vine to shade the root zone. Do not use thick mulches in summer, as they can promote Clematis wilt, a fungal disease that causes all or part of the foliage to wilt, usually in late spring, just as many varieties are beginning to bloom. If your Clematis wilts suddenly, cut the vines back to healthy growth—to the ground if necessary. An otherwise vigorous plant will resprout from below the soil. Fertilizing. Roses grow more vigorously, bloom more prolifically, and show greater resistance to diseases if fertilized several times during the growing season—in early spring (except the first spring after planting), immediately after the first wave of bloom, and again in early August. 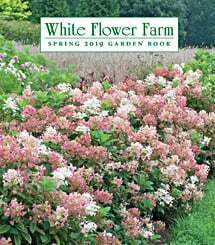 (Southern and western gardeners may wish to fertilize more frequently—fertilizing monthly from early spring until June, pausing during the heat of summer, and fertilizing again in August and September to close out the season.) We prefer natural fertilizers such as fish emulsion or seaweed extract, applied in solution, because they release their nutrients more slowly and evenly. About pests and diseases. The Roses we offer were selected for their vigor and their resistance to pests and diseases. If planted and grown as we suggest, they will be healthy, and healthy plants are much less troubled than plants under stress. Even if a healthy plant does suffer at the hands of a pest or disease, it will likely endure and recover without intervention on the part of the gardener. Some roses are prone to fungus in hot, humid areas. Cleaning up old foliage and cutting back affected canes is important for disease control. Spraying the leaves with Bordeaux mixture, a copper-based fungicide, can help once symptoms appear (follow the manufacturer's instructions). Pruning. Prune Roses to remove deadwood and to control ungainly growth. Deadwood can be removed at any time. Remove the spent flowers to promote more bloom, cutting the stems back to the second set of 5 leaflets. For the Clematis, early next spring—after the plants have spent a year in the ground—prune the stems of all varieties to the lowest pair of healthy buds. Thereafter prune to control size and shape or to encourage more profuse bloom. 'Etoile Violette' can be cut back to 18″ every spring (or at least every 3–4 years) if desired. Overwintering. Much has been written about techniques for overwintering Roses. In our experience, the best way to get Roses through winter is to choose plants adapted to your climate zone. That said, if you live near a Rose's cold limit and you garden on an exposed site or in an area where rapid temperature fluctuations are common, you should mound two shovelfuls of composted manure, garden soil, compost, or shredded leaves over the base of the plant in late fall—ideally after the ground freezes. Pull the mounding material away from the stem as new growth emerges in spring. Do not prune Roses or Clematis back in fall; wait until spring to prune branches injured over winter.